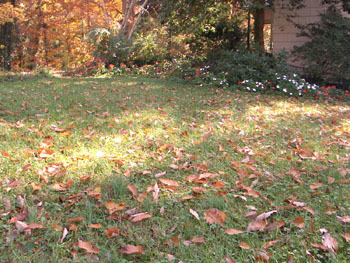 A good time to do a little maintenance on your Zoysia lawn is just prior to the start of the fall season. One issue to watch for is thatch build up. Zoysia’s tough stem tissue can encourage thatch, a layer of partially decomposed plant material that builds up on the soil. Removing it helps water and nutrients get to the surface of the soil. Use a hard rake to rip up the thatch, this can be a bit of a workout, or try our easy to apply organic liquid thatch remover. Aerating is the process of poking holes in the soil to allow water, oxygen and nutrients to better penetrate to the roots of your lawn. This can be done up to once per season to keep your grass looking great. Make sure the ground is softened by watering the day before aerating. Use an aerator with hollow tines (most equipment rental stores will have them) and criss-cross your lawn putting at least 12 holes per square foot. Make sure not to aerate your lawn during dry, drought conditions when the soil is particularly hard. Unlike cold weather grasses, Zoysia is best fertilized in the spring, not the fall. Zoysia starts to harden in preparation for the cold weather and fertilizing after August can hinder that natural process.